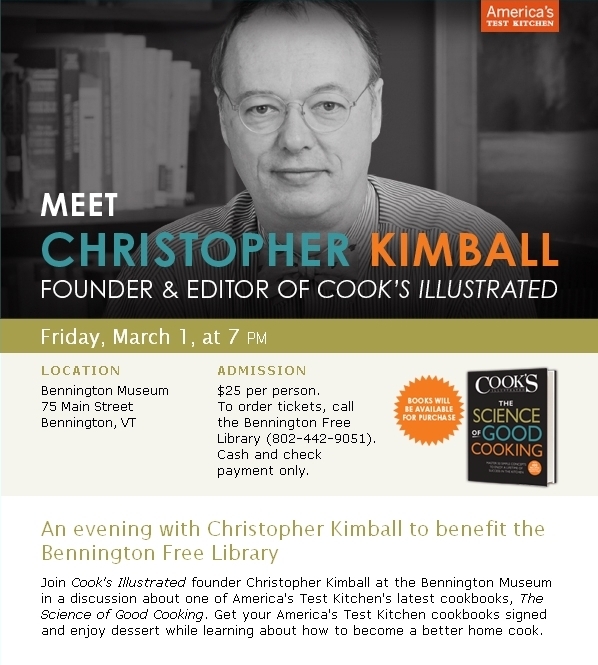 Christopher Kimball – of Cook’s Illustrated and America’s Test Kitchen fame – will be appearing at the Bennington Museum on March 1, for a discussion of the Test Kitchen’s latest book, “The Science of Good Cooking”. Tickets are $25, and proceeds will benefit the Bennington Free Library. Kimball will sign copies of the book, and dessert will be served as part of the event (I’ll bet it’s going to be awesome). Kimball (one of the nicest guys ever – he was a regular guest on the radio show I used to produce) lives in southwestern Vermont, so this cause is likely near and dear to him. Purchase tickets by calling the Bennington Free Library at 802-442-9051. Not familiar with Chris and his bowtie? Lots of ways to enjoy his wit and expertise: Cook’s Illustrated magazine and online, Cook’s Country magazine and online, America’s Test Kitchen (which is a TV show as well as a radio show/podcast), and he’s an occasional guest on public radio’s The Splendid Table. Quite a little empire he’s got going on. Kimball is extremely entertaining and knowledgeable (as well as stodgy and puritanical) , and this promises to be a fun evening. Bennington is not far from here at all – road trip, anyone?